It’s classic stuff and spat out as it is by a virile John Howard (the spunky one) post game, well, you’ve just got to love it. 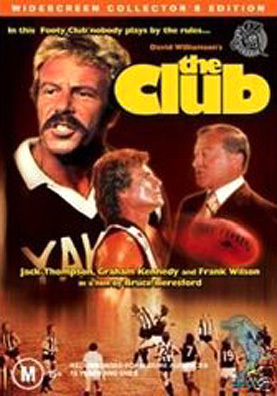 Jack Thompson, sporting a hefty sandy handlebar as Laurie, Collingwood coach of eight years and ex star player, is the recipient of this outburst in the change rooms. To his ears, Haywood’s words are treasonous, especially when the hot shot recruit adds that he was stoned on the field and preoccupied with the beauty of a passing seagull, hence his pathetic performance. This is not just a film about football, though, it’s about politics too and they are particularly vicious behind the scenes at The Club. Graham Kennedy gives a knockout performance as President-on-the wane Ted Parker, flexing his diplomatic muscle in one memorable scene (selection # 6 on the DVD) where the work of director Bruce Beresford and his trusty DOP Don McAlpine shines. The tracking down the stadium aisles and crane shots up over the hallowed ground of Victoria Park oval are poetry in motion. In an interview on one of the special features of this new DVD, Thompson says it is ‘nicest scene’ of his career and adds that he was never fitter in his life or more obsessed with football than while making this film. He even sings the Collingwood Football Club Song, or rather reverentially intones it, as one of the many fascinating extras. This Umbrella release was taken from a brand new print made by ScreenSound Australia as park of its Kodak Atlab Collection and it scrubs up very well indeed. Even if your football sentiments are like leading man Geoff’s, I’ve got two words for you: stubbies galore.